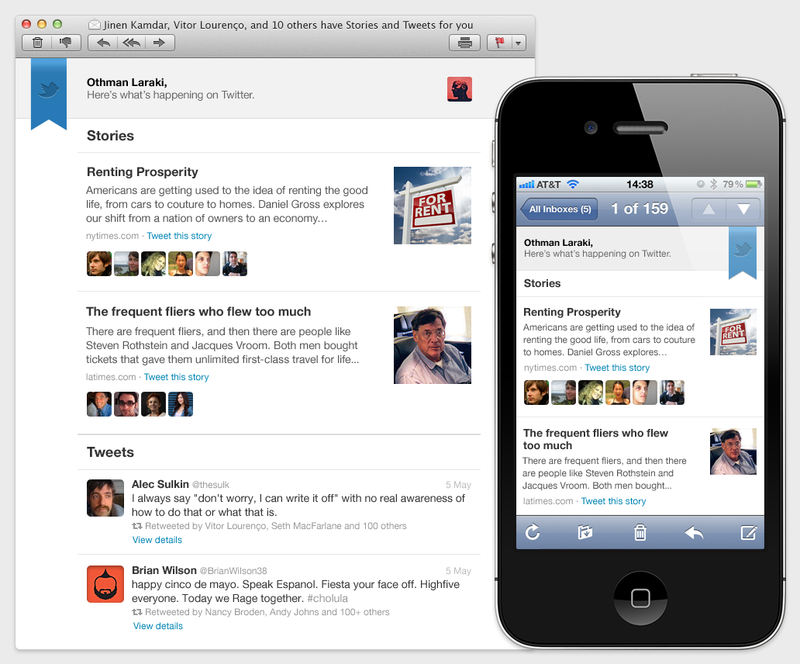 Twitter is expanding the reach of its social network right into your inbox. The micro-blogging platform has announced that users now have the option of reading the "best of Twitter" in a weekly e-mail digest. The e-mail digest isn't exactly the best of your Twitter feed, though. Instead, it is designed similar to Twitter's Discover tab, and highlights popular trending stories, not tweets. The digest will show only the first few lines of each story, and users will have to click on headlines to finish reading any particular story. Users will be able to tweet about the story directly from their e-mail platform, and also see related tweets from people they follow. According to Twitter's blog post announcing the feature, the digest will also feature popular tweets -- but not from people you actually follow. According to the post, you will see the "most engaging tweets seen by the people you follow, even if you don't follow those who wrote them." So you'll basically see popular tweets from people your followers follow. You'll also be able to see whether these popular tweets were retweeted or marked as a favorite by people you follow. A weekly e-mail digest is a change of direction for Twitter, whose main draw is its ability to relay information quickly and in real time. But this e-mail digest doesn't focus on tweets; it looks at general trending topics and "engaging" tweets, not necessarily from people you follow. While it makes sense that Twitter has designed its newsletter this way (it would make no sense for Twitter to pop out weekly e-mails with irrelevant tweets from people you follow), this digest doesn't seem like it'll be very useful if you already subscribe to any other type of news digest. The digest will give you a broad scope of what's trending in the world (which is what most news digests do), and will only be loosely tailored to your network. To sign up for Twitter's new weekly digest, go to your Twitter Notification Settings, and under "Updates," check "Email me with a weekly digest of Stories & Tweets from my network."